Trust the professionals at Los Angeles Carpet Cleaning .us to effectively clean your favorite upholstered furniture, highlighting its attractive color and restoring its freshness. Our top-notch upholstery cleaning service will get rid of stains, odors and allergens while protecting your furniture's delicate fabrics. Not only do we enhance the stylish beauty of your favorite upholstered furniture, we can actually extend its useful life-you avoid the high cost of replacement! Your upholstered furniture will once again be delightful to look at, adding charm and beauty to your home. Before we start working we'll test a tiny sample of your upholstery to make sure its fabric and color remain intact. Because materials are so varied-natural fibers, leather, polyester and vinyl to name a few-it is vitally important to employ suitable upholstery cleaning methods and technology for your furniture. Our experienced technicians will analyze the exact fabric type of each upholstered piece and choose the safest and most effective cleaning method possible. We want you to be delighted with the results! We devote our finest efforts and expertise to make sure that our customers are always satisfied. We value your business and want you to come back to us every time. We absolutely guarantee you will be pleased with the new appearance of your upholstered furniture. Standard upholstery cleaning is economically priced, with more complex fabrics requiring special treatment priced honestly and accordingly. Los Angeles Carpet Cleaning .us is Los Angeles's most trusted name in upholstery cleaning. Contact us today and ask for a free estimate. In some cases your upholstered furniture hasn't been cleaned in years, yet it's still in fairly good condition. Instead of a full professional cleaning, you can ask for an economical "dust down" treatment-a deep vacuuming process that gets rid of dry soil contaminants like dust mites, pollen, household dust and dander. Your furniture gets revitalized at a modest price. Dust can settle on upholstered furniture. It should be removed regularly, about once a month with vacuum cleaner attachments such as the upholstery nozzle and crevice tool. If you don't have a vacuum, a brush will do, however it will also scatter dust around. Use a range hood when cooking in order to reduce greasy soil in your home's air. Clean furnace filters to reduce soil in air. Use arm and headrest covers to protect areas against early build-up of soil from skin and hair. If people who wear shorts will be sitting on furniture, cover with washable throws, sheets or pieces of terrycloth to protect from body soil. Commercial upholstery shampoos work well and easy to use. However, if you prefer, you can use the following homemade preparation. Combine 1/4-cup of liquid dish detergent or laundry detergent with 1-cup warm water. Use a hand mixer to whip until dry suds form (the suds should look like whipped cream). Test upholstery in an innocuous area by applying dry suds with a cloth or soft brush and scrub lightly. 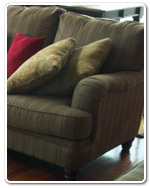 If the area looks the same but is cleaner, the entire piece of upholstery may be cleaned in this manner. Shampoo only a small area at a time and use a rubber scoop or spatula to lift away dirty suds. Repeat if necessary, and then wipe the area with a clean cloth dipped in clear water and wring until nearly dry. Keep upholstery as dry as possible when shampooing in order to prevent damage. For quick drying, open windows or turn on an electric fan, dehumidifier, or an air conditioner in the same room. Follow the cleaning instructions on furniture labels! Los Angeles Carpet Cleaning .us provides a complete leather cleaning service. We apply leather cleanser to remove all traces of soiling from the surface of the leather hide. This process takes some time and is completed by hand. This is because we want to restore your valuable soft furnishing to as close-to-new condition as possible. After leather is professionally cleaned and restored, we apply a refinishing cream and a protective coating. This enhances the attractive look of the leather and protects it from spills and further wear & tear. Call Los Angeles Carpet Cleaning .us now at 213-596-9756 for a free estimate on your next leather furniture cleaning / wood furniture cleaning / any upholstery cleaning.